A car’s suspension system connects its wheels to its body or frame and is responsible for providing greater handling and passenger comfort. It does this through the use of several components including springs, struts, shocks, control arms, bushings, and a sway bar. The springs, struts, and shocks serve to absorb bumps and jolts in the road while the control arm and bushings allow the wheels to move up and down. At Rieger Motors, we recommend that your vehicle’s suspension system be checked at least once a year along with a wheel alignment. Symptoms of worn or damaged suspension components include erratic steering, uneven or excessive tire wear, poor handling, wandering, leaning, and pulling. If you experience any of these issues bring your car in as soon as possible. 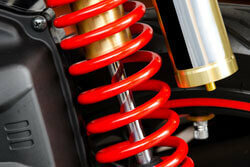 Bent or damaged suspension parts can cause premature damage to other parts of your vehicle. Rieger Motors’s service and repair center is located in Forrest, IL. Shock absorbers are mechanical devices found within a vehicle’s suspension system that serve to absorb or dampen bumps in the road. Located on each wheel, they are composed of an oil filled chamber and a piston. When a car hits a bump in the road, it compresses the shock, forcing oil through tiny openings in the piston. This creates hydraulic pressure, slowing the movement of the shock and subsequently the body of the car. Without shock absorbers, a vehicle would continually bounce and stopping distances would increase. At Rieger Motors, we recommend that your vehicle’s shocks be checked every year, along with your wheel alignment. Shocks are a normal wear component of any vehicle and you may not notice incremental loss in handling and control. Symptoms of worn shocks include cupping wear on tires, excessive bouncing, swaying, and increased stopping distances. If your car is exhibiting any of these symptoms, come by our service and repair center located in Forrest, IL. Come find out why Rieger Motors is Forrest’s and the surrounding communities’ number one choice for quality, affordable auto repair!